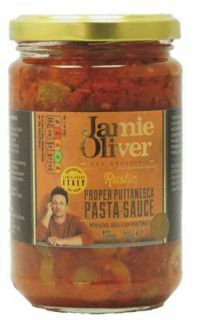 I love the classic Italian flavours in this rustic sauce! It's a store cupboard hero with loads of uses - try adding it to roasted chicken thighs for the last 5 minutes in the oven. Or keep things simple and stir through your favourite pasta with some fresh basil. Winner! Pasta Sauce with Mixed Olives, Sun-dried Tomato, Capers, Garlic and Chilli Pepper. Sold in a case of 6 jars. 280g per jar.